Decorate Your Dollhouse Like A Pro - Lighting to Painting! Dollhouses are enjoyed by both children and adults alike. While some people like to buy a dollhouse that is already decorated and comes with all the accessories it needs, others prefer to decorate and accessorize their own miniature house so it suits their own personal tastes. There are many ways you can do this and a vast range of different products are available to help you customize your dollhouse. You can buy things that improve both the external appearance of your house and add to the internal décor. Furniture and accessories will add to the style of a grown-up doll house and can create a vast array of play opportunities for children in a dollhouse for kids. Choosing your pieces or making your own is also an important part of the fun for people who own a dollhouse. You can decide exactly how you want it to look and then decorate and furnish it accordingly. Here are some ideas of the different things you should consider when decorating a dollhouse. One of the simplest ways to decorate and accessorize your dollhouse is by adding dollhouse furnishings. You can either buy the furniture ready-made or in kits to build your own. If you are unsure where to buy furniture, you will find plenty of different options online. Using the Internet as a tool, you will find everything from dollhouse bedroom furniture to a dollhouse bookshelf. For example, many retailers sell dollhouse furniture on Amazon and there are also specialist sites selling accessories for doll houses and craft sites that sell DIY dollhouse furniture. 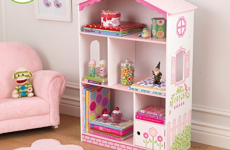 The type of furniture you choose for your dollhouse will depend on the materials, size, and style of your little house. If you have a plastic dollhouse, then you will probably prefer plastic furniture to accessorize. These are usually sturdy and easy to clean if your child plays with them a lot. Likewise, if you have a wooden dollhouse, then you are most likely to opt for wooden furniture. These are great for creating different role play situations for children or for adding detail to a stunning decorative dollhouse for adults. For example, a wooden toy kitchen will allow children to recreate various real-life scenes with their dolls. The style of the furniture is just as important as the materials if you are following a particular theme for your house. If you have a modern dollhouse for your child, such as a Barbie Dreamhouse, then modern furniture will coordinate perfectly. There are some amazing pieces available, including some with interactive features for an enhanced play experience. Alternatively, you can buy period furniture that matches the style of your dollhouse. So, if you have a Victorian-style house, you may prefer items made from dark wood, such as mahogany. While some houses come ready-made, there is also the option of building your own dollhouse. If this is your preference, then there are several different ways you can go about this task. The first option is to buy a dollhouse that is in pieces and just needs assembly at home. If you are a DIY novice, this is probably the simplest option. Most do come with detailed assembly instructions that give clear guidance on how to assemble all the pieces. Although this is often time-consuming, it is well worth the effort for the enjoyment the finished product can provide. 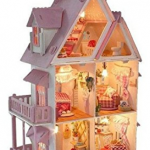 Another option is dollhouse kits to build and there are kits available to suit a variety of abilities and this is a popular way of building miniature doll houses. These usually come with pre-cut wooden pieces and you will need some crafting skills to successfully build the house. For example, you may need to glue or screw some parts together. As there are often small and fragile pieces, you may also need a delicate touch. Dollhouse plans are usually provided with these to help you build your miniature house. The final option is to build a custom dollhouse of your own design. This option is best suited to people with experience of DIY and some joinery skills. Wood is the best material to choose if you decide to create your own. 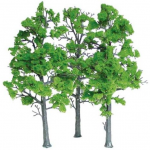 You can also use dollhouse building supplies for different aspects of your design. Building your own house is a good choice if you want a particularly big dollhouse or you want to customize a dollhouse for boys. Adding working features will create different points of interest and make the dollhouse a fun item to own. Lighting is one way in which you can do this and there are several options for dollhouse lights available. The first is battery operated lights that are wired into the house. If you have bought a dollhouse kit, then there will be instructions for how to wire a dollhouse included in the assembly instructions. If you are building your own dollhouse from scratch and buy a dollhouse wiring kit, you can find instructions for how to do this online. If you are not confident to wire lighting into a dollhouse, then you can opt for battery-operated LED lights that do not require any wiring. This is the easiest option if you have no previous experience of wiring. Finally, it is possible to buy dollhouse lights for different themes. For example, if you redecorate your dollhouse for Christmas as a display piece, then you can buy dollhouse Christmas lights to adorn your little house. To perfectly customize your dollhouse to suit your tastes, adding a splash of color can make all the difference. To do this, you will need some paint that is suitable for dollhouses. In general, there are two options; latex or acrylic paint. Latex paint is what is used in real houses so it makes sense that people will use this type of paint on their dollhouse. It is a great option for covering the larger areas, such as the exterior and interior walls. 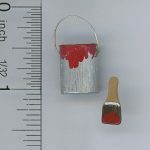 However, it is not suitable for smaller items that are fiddly to paint. This is because it is thick and gloopy. 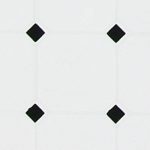 Acrylic paint is the preferred choice of most crafters as it is suitable for a variety of different crafts. However, there are lots of different varieties of acrylic paint and you need to get the right one. Avoid student grade or heavy bodied acrylics and opt for a lighter, runnier acrylic. The roof area of your little house is one of the most prominent external features and can dictate the style of the dollhouse. One way of adding décor to the roof is to use dollhouse shingles. 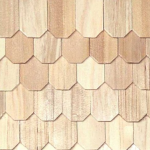 These are available in a wide range of different sizes, shape, and colors that reflect the different varieties of shingles on real houses. Opt for something that keeps with the period and style of your dollhouse. To add style to the interior of your dollhouse, you can use wallpaper. Not only will this add some color and design to the interior, but it is also a way of creating either a look that runs through the whole house or a different style for each room. While you can use leftover wallpaper from your home in your dollhouse, you may encounter a few problems. First, the design is likely to be large and not in scale with the house. Second, real wallpaper is quite heavy and you may find it difficult to apply to the small walls of the house. 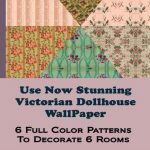 Instead, buy wallpaper that is specifically for the purpose of decorating a dollhouse. There are also websites where you can download a wallpaper design and print it yourself. A dollhouse is so much more fun and appealing if you have a dollhouse family. In an adult dollhouse, you can pose the characters in different positions around the house. 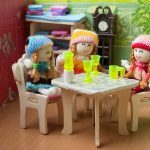 In a child’s toy dollhouse, children can give each of the dollhouse family characters and then role-play different scenarios that relate to their own personal experience. While some dollhouses come with little people others do not. If this is the case, you can choose your own dollhouse people. Some characters come in a family set and you can buy others as individual people. This means you can choose the type of characters you want and reflect your own family if you so wish. It is also possible to customize your characters further by buying dollhouse clothing. You will find plenty of different clothing options available to buy, including dollhouse jackets, dresses, shirts and even shoes. Another option is to create your own dollhouse clothing if you enjoy needle-crafts. Flooring is another important element of the overall finish of your dollhouse. All the different varieties of flooring that are available in a real house are also available for a doll house. These are available at both specialist craft stores and from online retailers. Some of the options include carpet, tiles and wooden flooring. Which flooring option you choose will depend on your budget, the style of the house, the design and how the dollhouse is used. You may wish to choose a type of flooring that is in keeping with the style of the rest of the dollhouse or that reflects the period of the property type. If the miniature house is for decorative purposes, then carpet may be the ideal choice as it adds color and texture to the dollhouse. On the other hand, if it is a kid’s house and will be handled regularly by children, you may prefer an option that allows you to wipe clean the floor after your children have played with it. It is also possible to customize and accessorize the outdoor space surrounding your dollhouse and even create a pretend garden that increases the play options for a child when creating role-play scenarios with their house and dolls. For example, you can buy a dollhouse car, outdoor accessories and miniature trees to decorate the outdoor space. These are just some of the ideas and products you can use to make your dollhouse your own. Decorating your dollhouse is a lot of fun, regardless of whether you are accessorizing a pre-assembled dollhouse or buying items for a dollhouse you are building from scratch. As there is such a wide choice of accessories and furnishings available for dollhouses, it is possible to customize every aspect of your little house from top to bottom and truly make it your own. There are products available that are suitable for a variety of uses, from play items for children to decorative pieces that are perfect for an adult miniature dollhouse enthusiast. 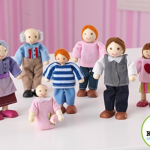 It is easy to find all of these items online, from craft stores or from toy retailers. To see all our dollhouse info and cool ideas click here!